California Sun | Seal Beach, Ca. I love hanging out at Seal Beach. It’s a quiet little beach town just north of Huntington Beach, aka Surf City. Just north of Seal Beach is the Long Beach harbor. On a crystal clear day you can see the Queen Mary from the pier. Seal Beach has managed to preserve a lot of their history over the years, which I have a tremendous amount of respect for. It’s one of the rare few beach towns in Southern California that has not been overrun by land developers. I have many fond memories of growing up around this town. My father and I used to get breakfast at the Ruby’s on the end of the pier, which sadly is now closed. Seal Beach is where I started learning how to surf. The conditions at this beach are pretty mild and the crowd is very chill, a perfect combination for anyone looking to learn how to surf or even body board. I was almost about to pass going to Seal Beach on the evening I shot this photograph. I was just getting off work on a Friday night after working late from a production release. The sky was gray and boring and there were no clouds anywhere. I thought for sure it would be a waste of time to even stop. 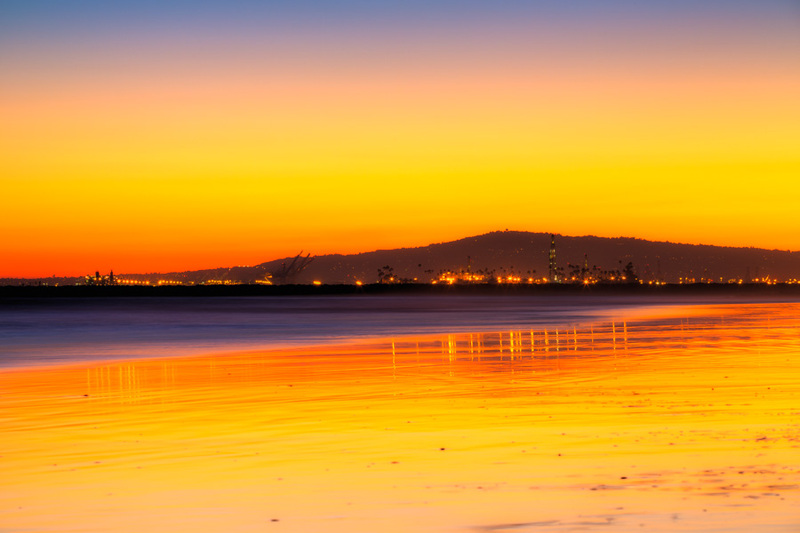 When I finally arrived at Seal Beach, the sun was just starting to tuck back beyond the horizon and I was greeted by a surprise burst of colors over Long Beach. I sat there in my jeans on the wet sand watching the sunset, camera mounted on my tripod before me, not worrying about a single thing in the world.